The band, comprised of Timmy, Mark Franks, Mike Crawshaw, Lachie Champman and Darren Everest, are a platinum-selling doo-wop vocal harmony group. 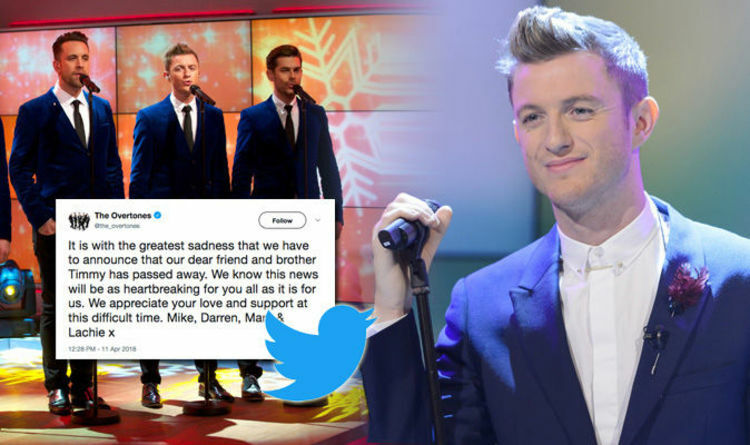 A representative for The Overtones told Express.co.uk that there was no information as of yet about the circumstances surrounding his death. “We will issue more information in due course,” they added. After being diagnosed with stage three malignant melanoma, Timmy released a statement saying: “I need to share some news with you about something that is going on in my life at the moment. “I’m devastated to actually be writing this but unfortunately I won’t be able to join the boys on the road for this Christmas tour. “In Sept this year I was diagnosed with melanoma (skin cancer),”(sic) he said. “In October I had an operation to remove some lymph nodes and had hoped that would be the only treatment required. “But just recently more lumps around my collarbone and neck were discoverer which will need further, ongoing treatment. Timmy later returned to touring with The Overtones in July last year. On May 3, Irish-born Timmy was set to take on a skydive in aid of The Royal Marsden Hospital, where he had received treatment. On the JustGiving page for the skydive, set up four months ago, he explained that he wanted to raise money for vital cancer research. Speaking about his treatement, Timmy explained he had started immunotherapy in March 2017, adding: “I am happy to say that I am one of the lucky ones who has responded amazingly to this treatment. His JustGiving campaign had already raised over £5,000 for the charity.